Without too much difficulty I convinced five of my co-workers, all of us chemistry professors, to meet up for a night of drinking strong, dark Belgian beer. 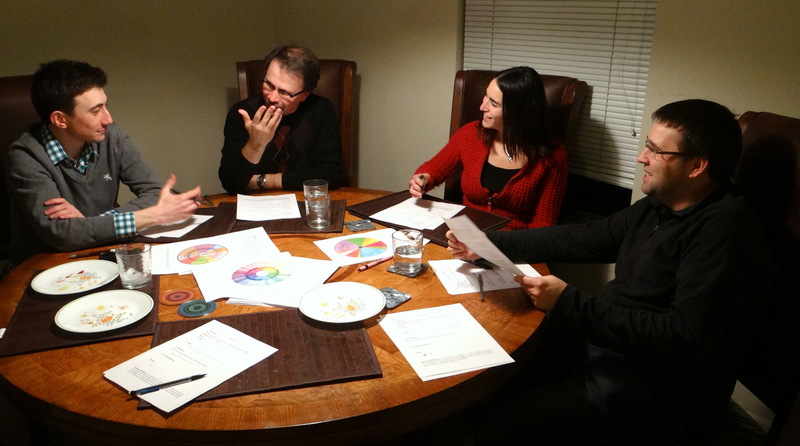 Josh agreed to host the event at his place in downtown Columbus and we were joined by Hannah, Anita, Tom and Chris. My wife Laurinda attended and helped out with the pouring so that we could do a true blind taste test. So a big thanks to Laurinda and Josh. 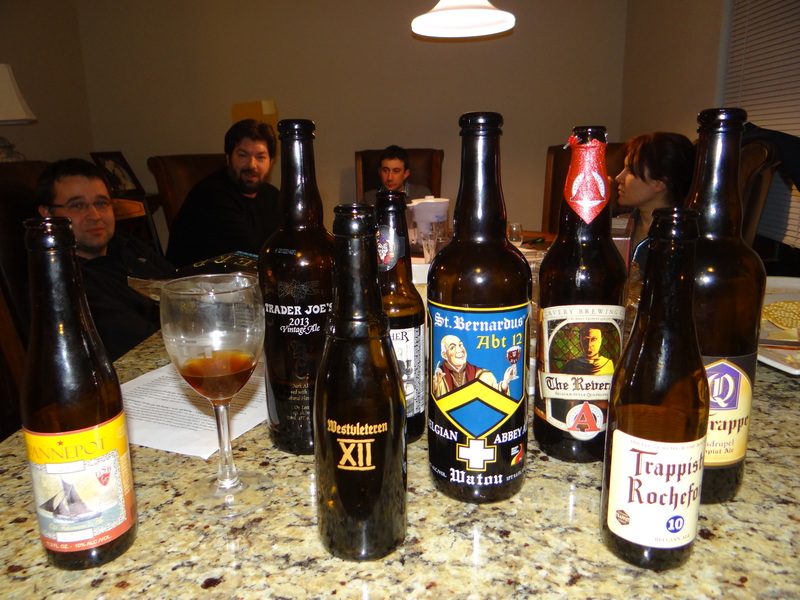 As you see in the picture below the merits and flaws of each beer were vigorously discussed. This Pennsylvania brewed beer is a seasonal only released in November and December. At 11.8% abv this is the strongest beer in this round, one that pushes up against Ohio’s legal limit of 12%. This beer finished at or near the bottom on just about everyone’s ballot. It was a clear reddish amber color, both the lightest and the clearest beer of the evening, with very little head. Several people noted a bubble gum like aroma in the nose, like you sometimes find in a Hefeweizen. The alcohol was very apparent in this beer, especially at the finish. In the end we felt it was too boozy, too sweet, and did not have the redeeming dark fruit character that you look for in a good quad. This beer has the lowest abv and price, but is probably closer to a dubbel than a quad, but Hannah had some on hand and we thought it would be fun to throw a $5 bottle of beer into the mix with the more expensive offerings. This beer, which is actually made by the Canadian brewery Unibroue, was generally well liked by everyone. It has all of the characteristics of a strong, dark Belgian beer (dark roasted malts, dark fruits, chalky yeast) and the alcohol is well hidden, but compared to the other beers in this contest it sort of fades at the finish. That makes a lot of sense because this beer is not sold as a quad and is probably closer to a dubbel. Still at the price point of $5 for a 750 mL bottle (half the cost of Three Philosophers), it’s a great bargain. Our runner up comes from Colorado’s Avery Brewing which is known for making big, bold beers. The Reverend is made with imported Belgian specialty malts and candy sugar. This beer has a deep golden amber color, without much haze or suspended matter. The aroma and taste ooze with rich caramel and butterscotch, and fleeting highlights of vanilla and lighter fruits (peaches, bananas). The malts are more prominent in this beer, but it stops short of being cloying. You know the alcohol is there but it’s not overpowering. 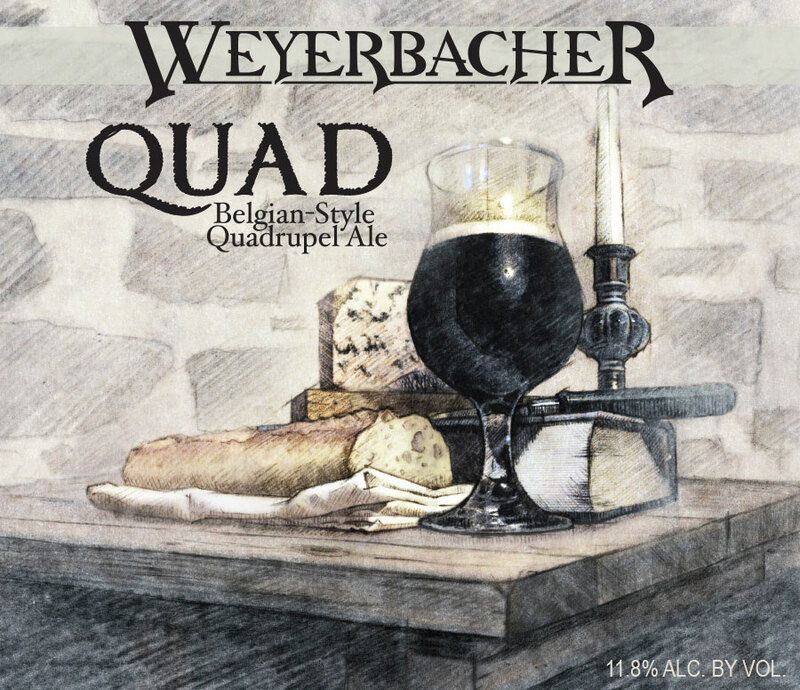 It’s a quad that nicely emulates the La Trappe style of Belgian Quads (think English Barleywine), but is quite different from the dark fruit quads of Rochefort and St. Bernardus. Three Philosophers is the clear winner as one might have predicted based on the BeerAdvocate and RateBeer scores. For a quad it is nicely balanced and drier than you would expect. The Kriek that is added to this beer gives it some nice cherry highlights. The Reverend was also well liked, with a rich caramel/butterscotch character. 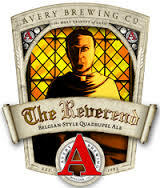 If you like La Trappe Quad and are looking for a more affordable American brewed alternative The Reverend is a great option. Your favorite between the Ommegang and Avery quads is really a question of your personal tastes. 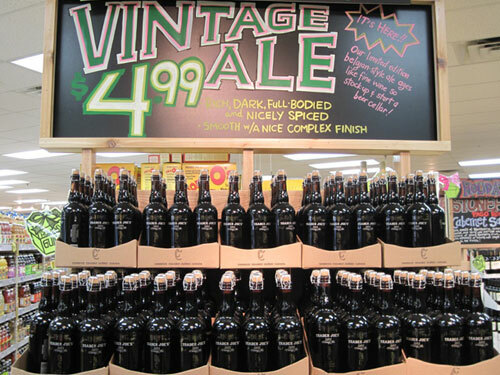 The Trader Joe’s Vintage Ale was a fine beer, but really closer to a dubbel than a quad. The Weyerbacher Quad was too sweet and the alcohol was too overpowering, a combination that was not very well received. Some cellaring/aging of this beer would probably improve it, and in fact Weyerbacher recommends aging for 12 months before drinking. I visited Belgium last summer, mainly for the beer. I was surprised at how many pubs and cafes had Boulevard Sixth Glass or Tank 7 right alongside Chimay, Rouqefort, and the other Belgium heavy hitters. Next to the Chimay Blue, I rank Sixth Glass as my favorite beer. Interesting, although Boulevard is owned by Duvel so I guess it makes sense that they distribute to Belgium. Curious to see how the St. Bernardus and Westvleteren compare. I have had both at different times, but never at the same time or blinded. St. Bernardus brewed under a license from Westvleteren for almost 50 years and the recipes are supposed to be very similar according to my Belgian friends. That is an interesting question. In the next round I decided to give Rochefort 10 another chance and put it into the final round and so we do compare it blind with Westvleteren and Pannepot. So if you come back for the remaining posts I will talk about the comparison between Rochefort and Westvleteren. Maybe I should have done that with St Bernardus as well. What I can tell you is that of the nine quads we tried St. Bernardus and Rochefort are definitely the closest approximations to Westvleteren. There are differences though. From my limited knowledge I think the differences come from different strains of yeast each brewer uses more than anything else. Aha! I just see you posted the next installment. I will have to read it. I would have to agree with you that it mostly comes down to yeast. Quads are my favorite so I am enjoying this series immensely, thanks! In this spirit of quads, if you ever see this beauty stateside or something else from this brewery make sure you get your hands on it: http://www.ratebeer.com/beer/de-molen-mooi-meedogenloos-beautiful-ruthless/126216/ Plain bottle, plain labels, but spectacular beer! Thanks for the tip. I was not aware of this beer, but I will keep an eye out for it. 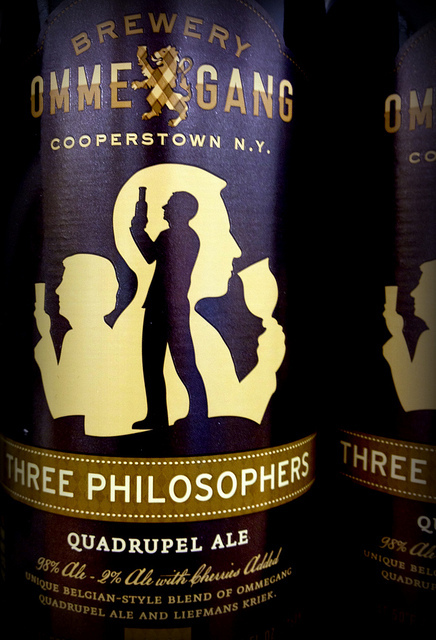 Ommegang Three Philosophers is a beer that is available at the Publix grocery store chain, which makes it easily accessible as a last minute pickup item. It is well liked by me and also a friend of mine after sharing a bottle during NFL playoff games. Avery the Reverend is out of stock at a local TotalWine, but the group high ratings made it earn a spot on my to try list when it is available again.